There is nothing better on a cold winter afternoon than cozying up with a great book and a hot cup of tea. So we are excerpts from some of our favorite novels from some of our favorite authors and matching them with wonderful tea. Today Amanda Flower is back -- this time with a book from her Living History Series. 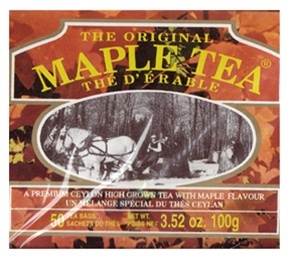 I selected the Original Maple Tea to go with The Final Tap. Read the excerpt below to find out why. Part of my life is stuck in 1863, and I’m starting to realize that might be a dangerous place to live. The thought struck me in the early morning while standing in the sugar maple grove on the west edge of Barton Farm’s grounds as my toes curled in from the cold despite two pairs of woolen socks and sturdy snow boots. It wasn’t so much the cold that made me question my life; it was the large man standing a few feet in front of me brandishing a hand drill as if it were a bayonet. It had been an unseasonably cold winter in northeastern Ohio, and even though it was the first week of March, the high temperature still hovered in the twenties. The weatherman had made some murmuring about a break in the weather by midafternoon, but he said it with some trepidation. He probably feared for his life if his prediction turned out to be wrong. Staring at Dr. Conrad Beeson and his drill, I could relate. Beeson was a large man, well over six feet and likely to tip the scale at three hundred pounds. He wore black-rimmed glasses and had a full beard that he kept neatly trimmed. My tan and white corgi, Tiffin, stood at attention, ready to defend me if the need arose. His soulful brown eyes were trained on Beeson’s drill. He opened his mouth as if he was about to argue the point some more, but I was quicker. “I can understand your frustration, but I have no control over the weather.” I did my best to keep my voice even. It was a bit of a struggle. The good doctor was wearing on my last nerve. I sorely regretted including a tapping presentation to kick off Barton Farm’s Maple Sugar Festival, a new weekend event on the Farm that I hoped would become an annual tradition and earn some much-needed revenue. During the quiet winter months, the money-making half of Barton Farm—the historical village across Maple Grove Lane—was closed. “We could always wrap electric blankets around the tree trunks to heat up the sap. Would that help?” Benji Thorn, my new assistant, asked. She stood beside me with her hands deep inside the pockets of her down coat. Benji was new to the position, but she wasn’t new to Barton Farm. Now in her senior year of college, she’d worked at the Farm every summer since high school as a historical interpreter. I shot Benji a so-not-helping look. “This is supposed to be educational, Dr. Beeson. I thought that as a college professor, you would recognize that,” I said. I counted to ten, backward, to stop myself from saying something I might regret or something that would make Beeson quit the Maple Sugar Festival altogether. There wasn’t enough time to find a replacement instructor for the tree tapping class; I’d already scrambled to find Beeson when my first expert had backed out. I had things to do—three school buses of third and fourth graders from New Hartford Elementary School were bound for the Farm at that very minute. My director of education had devised a school program to tie in with the Maple Sugar Festival, and I needed to return to the visitor center to greet the children. Benji wasn’t a count-to-ten-backward kind of girl. The book Benji was referring to was Maple Sugar and the Civil War, Beeson’s scholarly text that had been released a few weeks earlier. During the Civil War, maple sugar was a hot commodity in the north, since after the south ceded from the Union, sugar cane and molasses were hard to come by. In its place, the northerners used maple syrup to sweeten their coffee and to bake with. So when I’d needed to quickly find a new instructor for the tree tapping class, I’d thought Beeson was the ideal candidate—his book fit perfectly with our Maple Sugar Festival, especially since I’d have a small group of Civil War reenactors on the Farm grounds during the festival. “If it’s too cold to be outside, it’s too cold for sugaring,” he said before stomping down the pebbled path in the direction of the visitor center. After the professor disappeared, Tiffin relaxed and started sniffing the bases of the many maple trees in the grove. The land that became Barton Farm had been purchased by Jebidiah Barton around the turn of the nineteenth century. There were already maple trees there when he arrived, but in 1820 he began planting more, with the intention of starting up a maple syrup business. It was one of the many farming endeavors the Barton family tried over the years to keep their farm profitable. They were also known for their livestock and their beekeeping. When the trains made it to the northeast corner of Ohio, Jebidiah and his son started shipping their honey and maple syrup back East to their home state of Connecticut. This went on for five generations. Eventually, the last of the Bartons’ living relatives willed that the Farm be turned into a museum to preserve local history and teach the community, especially the children, what it was like in pioneer days in Ohio. That happened in 1964; it wasn’t until the Cherry Foundation donated the money to renovate the buildings and grounds that the Farm actually became a museum. I was the second director of Barton Farm, and the first one to live on the grounds year-round. “Can you please try to play nice with Dr. Beeson?” I asked Benji. I hid a smile. “I don’t think you can have a PhD in maple sugar. His degree is in horticulture, and we’re lucky to have him for this event, especially on such short notice. 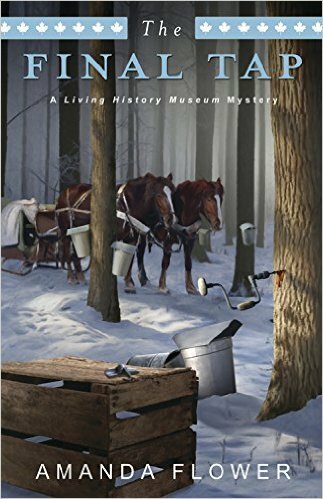 His book really illustrates the history we’re sharing with the community this weekend.” After the festival opened on Friday with the tree tapping class, it would get into full swing over the next two days with pancake breakfasts, maple sugaring demonstrations, and the reenactors talking about the importance of maple sugar during the Civil War. Benji snorted. “He should be thanking you for hiring him at all. We’re certainly paying him more than he deserves. I can’t believe he questioned his honorarium. It’s not like he came from out of state. She had a point. Beeson’s speaking fee was higher than I’d expected, but when the original expert was struck down by a mysterious illness and landed in the hospital, I couldn’t quibble over details. Of course, I’d thought Beeson was the perfect replacement instructor. And as mentioned, I’d been wrong. “Mine already have,” she said with a sigh.